One of the best parts about the holiday season is watching the professional athletes spend some time in the community and give back to those who need it the most. 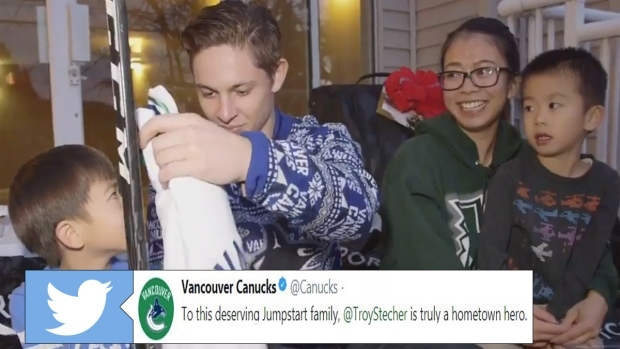 Earlier this month, Vancouver Canucks defenceman Troy Stecher teamed up with SportChek and surprised a family in his hometown of Richmond, BC, with some new sets of hockey equipment for the kids just in time for Christmas. The 23-year-old surprised the two kids with everything from new skates to a new helmet and even left them with their very own No. 51 Stecher Canucks jerseys. The sophomore defenceman didn’t stop there, though. Earlier this week he teamed up with Brock Boeser and Canucks For Kids to surprise another family in the Vancouver area with some gifts ahead of the holidays. The Canucks will look to end a three-game losing skid before the Christmas break when they host the St. Louis Blues on Saturday night.